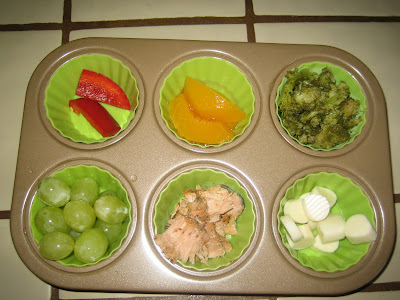 This weeks muffin tin is a little more colorful: Red pepper slices, home canned peaches (a fave), steamed broccoli, green grapes, bbq salmon (left over, another fave), and string cheese circles. Still loveing my $11 Kohls muffin tins and the silicone insert that came with! I think many of the moms who participate in MT meals also do bento boxs and I think they are s cute. May have to give it a whirl!